Between 2008 and 2011, 12-month (calendar year) sales at Empire-Sobeys limited rose 11.50% to $16.2416b 53 weeks ended 2Q12 (Nov 5) which is up from $15.6407b the previous year. That compares to only 1.5% for Loblaw Companies and 1.6% for Metro Inc. Since 2006 (the first full year that A&P Canada was a part of Metro) fiscal year Metro sales ($11.431b) have increased by only 4.3% compared to 24.7% for Sobey's (minor boost for Sobeys came in 2007 when it acquired BC chain Thrifty Foods for $260M; for the past eight years Sobeys has led the industry in same-store sales growth). In 2013 Metro Inc net earnings jumped 47.5% to $721.6m however $266.4m was gained from the disposal of an 11% stake in Couche Tard (world's largest convenience store operator). May 4, 2014 Sobeys stores occupied 38.7 mil ft2 (up from 29.9; up from 29.3m) 19.6% owned (up from 15.8%). in its fiscal 2014 report Sobeys announced the closure of 50 stores (1.5m square feet) 30 in Western Canada. the closures will improve the company's bottom line because the stores are consistently underperforming - administrative costs for this $169.8m (incl $137.1m severance) are already accounted for in 2014 fourth quarter results ; will reduce future sales company-wide by approximately $400 million. quarterly dividend - Sobeys dividend for 2Q2016 was 10 cents (20c for the half up from 18c) unchanged in 3 months, up from 9c six months earlier. By comparison Loblaws dividend for the same quarter was 25c (up from 24c six months earlier); Metro Inc dividend 14c +20%. Sobeys dividends were higher in CY2014: dividend for 2Q2015 was 27 cents (54c for the half up from 52c), same as three months earlier, up from 26c nine months earlier, up from 24c in 3q2013 (24c was unchanged from 2q13 but up from 22.5 cents a share in 3rd, 4th qts of 2012). This is higher than Loblaws (3Q14 24.5c; up from 4Q13 24.0c; up from 1Q13 22c; dividend had been stuck at 21c for over 6 consecutive sessions until 4Q12 when it was increased to 22c) and Metro (4Q14 30c; up from 25c Dec.21 same as Jul 2013/Dec 2012 qtr but up vs previous year 21c q2q). Sobeys ends fiscal 2013 on high note, ups quarterly dividend to 26c higher than Metro 25c, Loblaws 24c ! Canadian retail food market - report dated Feb 19, 2014 - CY2013 retail food sales represent 19% of all retail sales ($89 billion +2.2% out of $483b billion +2.7%). 2007-2012 food sales up 19% with forecast compound annual rate of 1.2% through to 2017. June 12, 2013 - Sobeys announces a C$5.8 billion deal has been made with Safeway for its 223 unit strong Canadian division (213 grocery stores + 10 liquor store). Western Canada is home to all but 6 of the locations (6 in Ontario). The deal is significant for Sobeys - becomes market leader in fast growing Alberta (locations -> 234; median income +21% vs national), and supermarkets in British Columbia beyond just Thrifty Foods (3 Sobeys -> 78 Sobeys + Safeway). Also included in the deal are 199 in store pharmacies, 10 liquor stores, 12 manufacturing plants, and 62 gas stations. The deal will be paid for in cash with funds coming from Empire equity issue and asset sales. Excluded from the deal is $300m of short term debt and 189 gas stations. 49 of the locations (plants + gas stations + liquor + grocery) are in Saskatchewan (16) and Manitoba (33). Safeway had revenues of $6.7b in the year ending March 23, 2013 up from $5.3 billion in 2011. Excluding all fuel stations Sobeys + Safeway = 1300 to 1523 (May 2013 stores down from 1315 -> 1300). pro forma annual revenue increases from $17b to $24b. more on the Safeway acquisition and my reaction June 27 - Empire Co sells theatre business in two transactions for $255m. Cineplex Odeon is paying $200m for 24 theatres in Atlantic Canada (170 screens) while Landmark Cinemas is taking the other 20 theatres in the rest of Canada for $55m. This deal was obviously made to finance the Safeway deal; Sobeys previously stated that $1b of the $5.8b needed will come from asset sales. Sobeys financed the Safeway deal with the following moves: An Empire's equity issue (July, 2013) in the amount of $1.85b.. Sobeys bonds sold in August raised $990m.. $990m from the sale of 70 Safeway properties to Crombie.. $1.97b from cash + credit. October 22 update - Competition Bureau forces Sobeys to sell 23 supermarkets as a condition of the deal. Only 13 of the grocery stores are part of the 213 acquired, the other 10 are Sobeys 7 IGA 1 PC 1 Thrify 1. -> store size calculated using info provided in annual reports. Loblaws and Sobeys provided direct info; Metro was calculated using only Metro, Food Basics, Super C, Richelieu full service supermarkets, Sobeys data from Empire annual information forms 2012, 2011 editions. Second chart excludes 24 Fast Fuel, 236 Shell stations. Metro Inc operating income taken as ebit (ebitda + depreciation and ammortization). 2013: 194 of Metro Inc 564 stores (34%) operate in the discount food sector compared to 257 for Empire-Sobeys (20%, FreshCo/Foodland) and ~30% for Loblaws. Sobeys + Safeway = 1538 stores + 322 gas stations (236 shell, 24 fast fuel, 62 safeway gas) . FreshCo was launched on May 12, 2010 in Toronto. It started out by taking the former locations of Price Choppers stores (87 in Ontario). To celebrate, Sobeys offered new customers triple A beef. 2013: Sobeys same store sales growth of +0.6% in the final quarter of 2013 is down from +1.2%, +1.3%, +1.8% in the previous three quarters (3rd 2nd 1st) and +0.7% in 4q of previous year. By comparison same-store sales growth at Loblaw Cos each of the corresponding four quarters (most recent first) is +1.1%, +2.8%, -0.2%, -0.2%, +0.2%, -0.7% (2nd, 1st, 4th, 3rd, 2nd, 1st). All three seemed to have their strongest quarters in terms of same-store sales in 1q2013: Loblaw +2.8% (Mar'13) vs Sobeys +1.8% (Aug'12), Metro +1.5% (Dec'13). 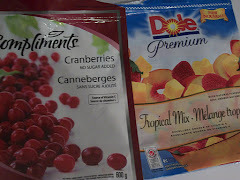 Fiscal 2013 Sobeys +1.3% vs +1.4%. Sobeys 2011 same-store sales growth by quarter +1.2%, +1.9%, +1.7%, +0.7%. Looking at it from a calendar-year perspective, Loblaw Cos 1.3% in its 3q was lower than Sobeys 1.7% in its 1q. Sobeys led the industry in same store sales for seven consecutive years). For the investor out there consider this: Annual Sobeys dividends have grown consistently year in and year out, per share they were at 40c in 2004, 60c in 2007, 66c in 2008, 70c in 2009, 74c in 2010, 80c in 2011 and 92.1c in 2012 (45.6c 1H, 46.5c 2H), 95.0c in 2013 (45c 1H, 50c 2H), 52.0c in 1H 2014. First Half Fiscal 2015 (ended Nov 1) : 26 weeks- net earnings of $240.0 million +2.5% (1q $123.1/2q $116.9) on group revenue of $12,217.8 million +35.6 (1q $6,227.7/2q $5,995.1). earnings much improved when considering only continuing operations: +67.7% total -> $240.0m; food retailing +57.9%-> $213.9m. revenue/earnings by segment: food: $9,011.7-> $12,217.8m +35.6% (1q $4,594.9/2q $4,416.8) , investments other $4.2m-> nil down. net earnings breakdown: food: $135.5m-> $213.9m (1q $113.5/2q $100.4) investments other $98.7m- >$26.1m (1q $9.6/2q $16.5). first half dividend: 54 cents (+2c), same-store sales up: half +1.6% (vs +0.1%), 2q +1.7% (vs +0.2%), 1q +1.3% (vs +0.1%), effective tax rate 25.2% 2q15 (vs 26.3% 2q14). Fiscal 2014 (ended May 3) : 52 weeks- In just 2 quarters Canada Safeway has managed to boost Sobeys annual sales by $2.806 billion or 16.13% (total company sales up 20.6% to $21.0b). Organic growth by Sobeys accounted for $394.1 million of increase in sales (price inflation / new stores however same-store sales were flat on the year). Gross Profit: Safeway stores boosted gross profit and gross margin by $502.1m and +0.28% (23.46% vs 23.18% without) respectively; gross margin up to 23.93% vs 23.14% last year. Sobeys total gross profit increased by $1.003 billion or 25.0% from $4.013b last year. net earnings: Sobeys: +$349.2m adj (vs $325.3m) or -$87.4m undjusted / Safeweay +$78.9m. consolidated earnings: food retailing $121.8m (vs $334.2m), investments $113.6m (vs $45.3m) with $84.2m coming from discontinued operations ($78.2m from empire cinemas). fiscal 2014 free cash flow $869.1m (vs $430.2m). food retailing totals: revenue 20.99 billion (up from $17.4b). 13 week quarter: Empire adjusted net earnings are $131.3m (vs $95.7m) $112.1m from food retailing (vs $80.6m), $19.1m from investments (vs $15.1m). unadjusted, the company earned a mere $0.8 million (food retailing loss of -$17.6m vs +$87.4m combined with +$18.4m gain from investments (vs +$18.5m). total consolidated revenue: Food: $5937.0m (vs $4256.8m) ; investments: $0.5m (vs $0.6m). operating income: Food: $6.0m (vs $128.8m) , investments: $16.9m (vs $21.5m) down due to real estate partnerships ($10.9m vs $13.7m) / crombie reit oper.inc up $4.9-> $6.9 million. Adj net earnings: food: $112.2m (vs $80.6m) , investments: $19.1m (vs 415.1m). 4Q2014: Funded debt to capital ratio at 38.0% down from 40.6% , net earnings from continuing operations: $1.5m ($0.02 per share) vs $102.5m last year ($1.51 per share). free cash flow is $626.1m (vs $187.5m). 3Q2014 (ended February 1) : 12 weeks- The Safeway acquisition starts to show up in results both positively ($1.62b of the $1.73b in new sales attributable to Safeway / organic sales growth at 2.7%, $113.3m) and negatively (funded debt to capital ratio up 21.6-> 40.6% (funded debt to ebitda 8.5x, up from 16.8x) / effective tax rate up 27.7-> 72.6% [39 weeks tax rate 28.6% vs 27.1%] ). net earnings down thanks to higher finance costs, lower operating income, offset by lower income taxes : earnings $6.4m $0.07/share (vs $71.4m $1.05/share). adj earnings $77.3m 0.84/share (vs $75.8m $1.11/share). consolidated revenue up 40.4% ($4287.5-> $6017.6m), food retailing sales up 40.5% ($4274.2-> 6004.4m) [39 wks +14.6% -> $15016.1m); food retailing revenue using reclassifications +40.4% ($4284.8m-> $6017.1m) [ 39 wks up 14.6% $13134.2-> $15050.8m], adj ebitda up 37.5% ($201.8-> $277.4m). same store sales down -0.2% (vs +1.2% 3q13). by comparison ss sales was +0.6% for Loblaws / -0.5% for Metro. costs: finance costs up 198% $12.5-> $49.7m .. $33.8m in higher interest expense is main driver here (new debt from Safeway deal). Empire's total asset value is up 78.5% ! $6958.9m (Feb 2013) -> $12,420.7m (Feb 2014). Investments Other (now quoted to exclude Empire theatres both for the current period and previous period - theatre operations now listed under discontinued operations) : revenue $0.5m (vs $0.7m). operating income: Quarter $106.4m (vs $138.2m) | Sobeys $99.8m (vs $127.5m); Half $240.3m (vs $313.2m) | from Sobeys $226.8m (vs 283.5m). Decrease attributed to highly competitive environment. Other sources of operating income: Quarter : Crombie REIT $5.4m (vs $4.2m); Genstar $8.0m (vs $4.6m); Other -$(6.8)m vs +$1.9m. <- includes organizational realignment and restructuring costs of $8.4m & dilution gains of $4.1m none of which were expenses last year. adjusted: net earnings from continuing operations a more respectable $78.1m vs $81.7m previous year. earnings up on account of cost controls ; operating margins were weaker. Effective tax rate: second quarter 2014: 26.3% (steady), first half 2014: 25.3% (vs 26.9%) <- timing of realization of tax benefits. Trailing 4-quarter ebitda | interest expense ratio down to 12.9X at 2Q end (vs 16.5X last year). Finance costs up +$7.8m to $13.3m.. why? because interest expense attributable higher debt capacity due to the acquisition of Safeway (closed on November 4). offset by increase in total finance income +$7.7m (higher interest income earned from investment of subscription receipts). Half : Company earned $234.2m (+34.7%): that represents 2.59% of total revenue ($9.0379b +2.0%), up from 2.25% a year earlier; Food Retailing revenue: $9.0337b +2.1%; investments other operations $4.2m (vs $8.5m). Food profit: $135.5m (vs 179.1), investments: $7.6m (vs 19.3) + $105.3m from asset sales. Total funded debt $1140.5 billion (+17.6% vs May 2013, +17.1% vs Nov 2012). 1Q2014 (ended August 3) : 13 weeks - Empire Co earnings down -39.6% ($107.6m -> $65.0m) to only 1.41% of revenue (+2.2% -> $4,609.4m) though when adjusted to exclude one time items, earnings not as bad (-12.6% -> $89.7m) ; eps from discontinued operations dragged down bottom line (-26c per share vs -1c previous period). income tax rate down: 27.4-> 24.6% thanks to timing of tax benefits. Funded debt: Sobeys -11.3m but investments +8.9m. $10.1m pre tax in transaction costs associated with the acquisition to Safeway factored into operating income. ebitda (-14.8% -> $260.7m). w to $49.7m, funded debt to capital ratio now only 19.9% vs 21.5%. operating income $175.0-> $133.9m: Sobeys -18.5% to $127.0m, investments/other -63.9% to $6.9m (previous period incl dilution gains of $11.4m, Genstar also down $4.6-> $3.1m). net earnings from continuing operations: $108.1-> $82.6m or $1.59->$1.21 per share : Safeway transaction costs -$7.1m. Sobeys accounted for $16.5m/$25.5m of the difference (divestment of Empire Theaters partly responsible), investments (-73%-> $3.4m). Sobeys oper inc $79.2m (-17.2%). consolidated net earnings: $65.0m (food $79.2 / invest -$14.2m vs +$11.9m prev period) or 96c eps basic (vs $1.58). remeasurement of assets + transaction costs totalled $18.3m net of tax - that widened net loss from discontinued operations to $17.6m up from $0.5m prev period. consol earnings per share -39.9% ($1.58->$0.95). same-store sales weak at -0.1% but not surprising (ss-sales also lower at Metro Inc -0.9%). Sobeys square footage +2.4% to 29.7 million sq feet. another factor to consider when looking at fall in bottom line is oper.inc from outside retail,realestate -> -$2.9m vs +$8.9m last yr.
Sobeys - the food retailing segment reported sales of $4,5949m (+2.2%) or $4,6060m when reclassification of lease revenue is included (+2.2%). food retailing profit: $79.2m (vs $95.7m -17.2%). Investments,other contributed $3.4m to sales (+$1.4m); consolidated revenue 4.6094b (+$100.3m). sales from discontinued operations bulk of which is Empire Theatres: +13.2% ($48.6-> $55.0m). total assets by segment Aug-Aug: food retailing $6455.1m (vs $6215.0m), other $2526.2m (vs $623.9m). Interest in Genstar, Crombie now at 42.7%, 40.7% respectively. fiscal year Sobeys sales +8.4% $16,055.5 -> $17,402.7m with $1,031.6m of the difference coming from new gas stations (Shell gas stations are considered part of food retailing division Sobeys); excluding new gas revenue Sobeys increased $445.8m +2.8%. empire total revenue 17,612.7m +8.4%. same-store sales up +1.3% on the year. Net Earnings up +13.4% $339.4 -> $384.8m, adjusted +13.8% $322.7 -> $367.3m, per share +13.2% $4.99 to $5.65. adjusted +13.7% $4.74 to $5.39. adjusted operating income $562.4m (up $48.5m or 9.4%). operating income breakdown : Sobeys $515.3m (+$39.5m or 8.3%), Investments $69.5m (+$11.0m or 18.8%). adjusted: Sobeys $504.7m ($39.1m or 8.4%), Investments $57.7m (+19.5% or $9.4m). net earnings breakdown : Sobeys $339.9m (+$35.8m or 11.8%), Investments $44.9m (+$9.6m or 27.2%), adjusted: Sobeys $331.0m (+$36.4m or 12.4%), Investments $36.3m (+$8.2m or 29.2%). 42.8% interest in Crombie reit worth $622.7m (up $102m). 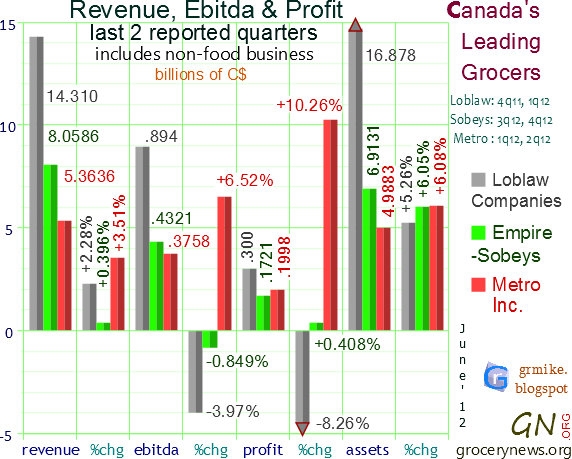 3Q2013 (ended February 3) Sobeys adj earnings +8% to $71.7m. Dividend steady at 24c, debt to capital ratio 24.6% -> 21.6%. Sobeys same-store sales up +1.2%. gross margin for the 39 week period down significantly (24.08% -> 23.03%) on account of lower margin fuel sales (excl that, gross margin steady at 24.25%). Quarterly revenue at Sobeys up by $348m -> $4.2848 billion; all but $97.1m of the increase in Sobeys revenue is attributable to the acquisition of 236 shell gas stations late 2012. Excluding that, revenue +2.5% -> $4.0274b, the strong food sales is attributable to price inflation and larger new stores though competition played a negative role (consumers less likely to buy pricier items). quarterly net income down -6% $75.2m, due to $(4.8)m accounting charge, 3q12 included +$9.3m from asset sales; crombie+other investments contributed $6.4m of the $75.2m profit. Earnings adjusted $1.17 per share ($79.6m). Total company revenue hit $4.34b during the qtr (+9.0%), $13.3038b in the 39 week period (+9.3%). 2Q2013 (ended November 2, 2013) Sobeys same-store sales increased +1.3% (+1.5% for the half), non-fuel gross margin increased slightly. 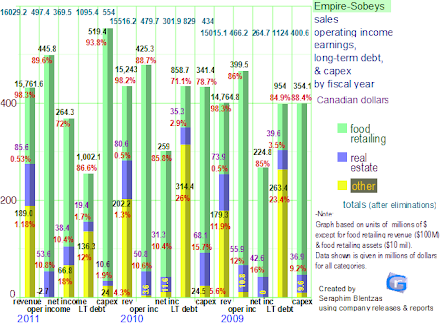 Sales at Sobeys (+9.1% to $4.3454b from $3.9838b) represents 98.7% of Empire Company revenue (+9.1 to $4.4041b). Just over $257m of the $355.95m change in Sobeys revenue ($515.1m / $750.8m in half) is attributable to 236 Shell gas stations acquired late last year (gas, convenience business is part of Sobeys). Funded debt to capital ratio is 21.5% down from 25.0% due to repayment of $200m non revolving credit facility. Net income for the entire company is up +19.46% to $93.3m (+15.2m) or $1.37 per share from $1.15 (adjusted earnings up +14.4% to $1.26 a share), $85.0m of which came from Sobeys (+24.3%). Empire Co profit increased due to higher operating income ($125.8m -> $140.9m) and lower finance costs ($15.0m -> $12.1m). Operating income is $175.1m (+17.60%). Sobeys was the source of 90.6% of the change in operating income ($127.7m +16.3%). Book value per common share is now $52.31 up from $49.98 (May 2012), $48.02 (Nov 2011). Investments added $8.3m in earnings (-1.4%) on revenues of $61.8m (+11.8%). 1Q2013 (ended August 4, 2013) Sobeys same-store sales increased +1.8% with gross margin steady at 23.15%. Revenue at both Sobeys ($4.51b) and Empire Company (+9.7% to $4.56b) broke into record territory. Just over $250m of the $403.5m increase in total company sales came from the newly acquired 236 Shell gas stations (gas, convenience business is part of Sobeys). Funded debt to capital ratio is 21.5% down from 25.5%. Net income for the entire company is up +22.08% to $108.9m or $1.60 per share from $1.32 (adjusted earnings up +21.6% to $1.52 a share). Operating income is $175.1m (+17.60%). 4Q2012 (ended May 5, 2012) Sobeys same-store sales increased +0.7% qoq. Sales at Sobeys food business was $4.0232b down -1.94% from $4.1026b last year due to an extra week last year (14 vs 13 this year). Quarterly profit from Sobeys food business was $79.1m (+4.8%) or $1.17/share (+5.4%) representing 88.4% of Empire's total profit ($89.5m +10.1%). Sales attributable to investments/other was up +7.2% to $50.6m. Ebitda from Sobeys up +5.27% to $203.7m (from $193.5m). Ebitda margin 4Q is 5.5% up from 5.06%. funded debt/capital 25.0%. 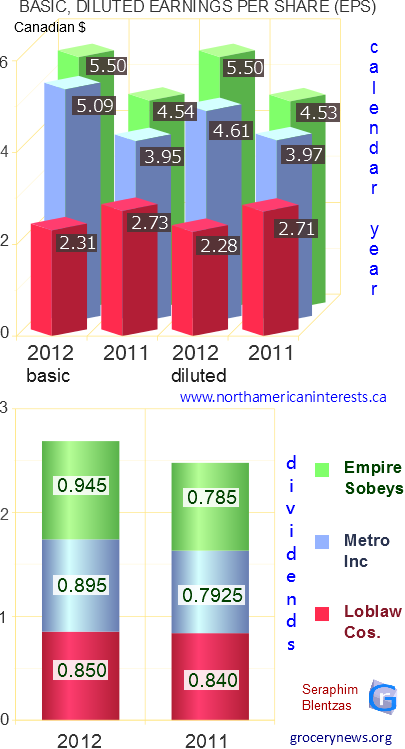 Empire Company handed out a 24 cent dividend up from 22.5 cents in 4Q2011 (Sobey's quarterly dividend increases are relatively new, was stuck at 20c for most quarters prior to Jan 2011). ($173.3m / $320.2m) came from Adonis and Phoenicia). I wrote about Metro's latest quarter 3Q2012 here. Sobeys same-store sales increased 1.2% qoq. However net income for the entire company was down 9.7% to $88.9m or $1.17 per share (-10.7%); Keep in mind though that last year's 3qtr earnings included $28.5m in pre tax expense reduction associated with post retirement benefits. Adjusted net earnings were down only -5.3% to $68.4m ($1.01 per share). Dividend per share = 22.5 cents. Empire's revenue for the quarter was up 2.8% to $3.98b, $3.94b of which came from the food retailing division (+2.9%, Sobeys, IGA, etc). Sales attributable to investments/other was down -2.9% to $47.6m. Ebitda from Sobeys declined by -17.8% in the quarter even though Sobeys gained $11.4m from the disposal of assets. Positive signs: 3rd quarter gross profit margin (profit/sales) increased to 24.1% from 23.9%. For the nine month period Empire's Food Retailing sales (+3.2% to $12.0213 billion) and profit (+0.7% to $222.9m, profit adjusted +7.5% $213.7m) were up, though ebitda was lower (-0.3% to $598.1m). Sobey's operating income -12.98% to $110.6m but most of that drop is from items not considered part of usual business operations (underlying operating income down only -2.9% to $101.5m). Food retailing net income (net of minority interest) down -11.95% to $72.9m. Consolidated Empire profit for the nine months for all business units is $247.3m (-22.3%) but remember that 107.6% of the drop is because the last period includes a gain from the divestment of Wajax. Investments/other 9M2012; net income (net of minority interest) up +6.6% to $17.7 million; including minority interest investments/other profited only $24.4 million compared to $$96.8 million in the third quarter last year ($76.2 of the decline is because last year's nine month period includes the sale of the 27.5% interest in Wajax). 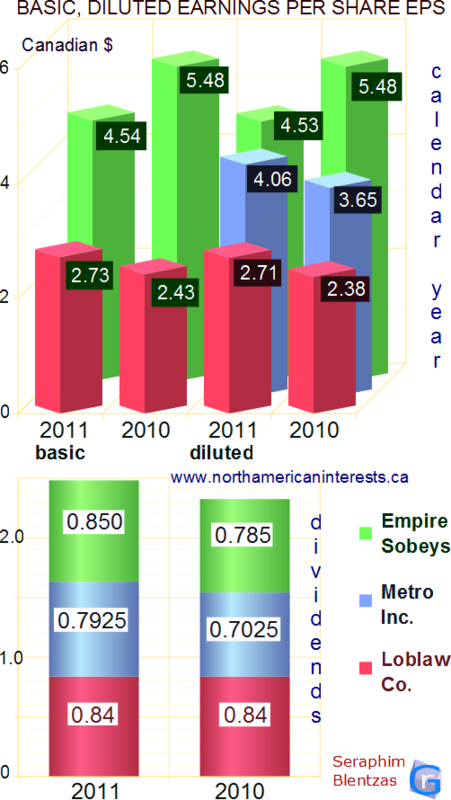 Empire-Sobey's now owns 44.6% of Crombie REIT down from, 46.5% on January 29, 2011. Interest in Genstar Development Partnership now at 40.7%. 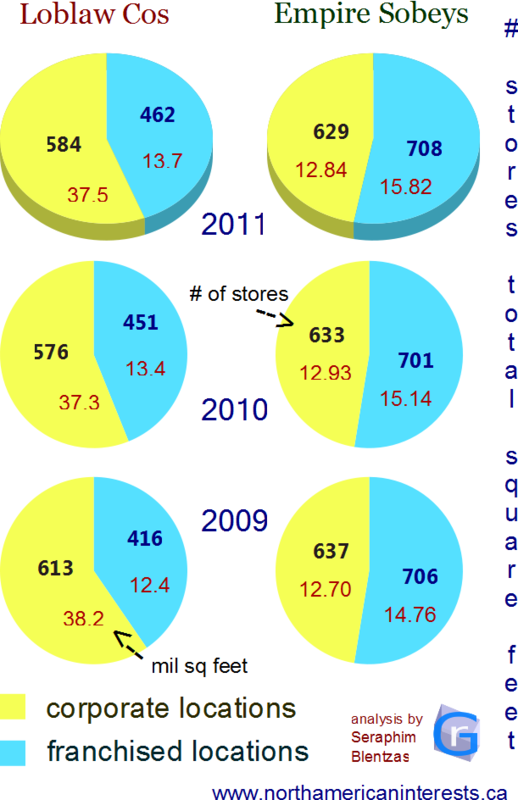 2Q2012 (ended Nov 5, 2011): Sobeys same-store sales increased 1.9% qoq. However all was not rosy in the 2nd qtr; net income was down 45.3% to $78.1M or $1.15/share remember though that $76.1M of the lost earnings are directly related to the sale of Sobey's interest in Wajax Income Fund. Funded debt to capital ratio was lowered to 25.2% from 28.0% the year before. Only 98c/share of Empire's EPS in 2Q11 came from business outside of Wajax so the profit drop isn't too concerning. For the 1st half of fiscal 2012 operating income was up 4.37% to $274.7M, ebitda up 4.40% to $444.5M while depreciation was +$5M for the half/ +2M for the quarter. Versus May 2011, long term debt is down a healthy 21.1% to $860.2M but debt due within the next year skyrocketed up to $238.2M from $49.4M in May 2011, $57.1M in 2Q11. Total assets are now at $6,536.8M up a full 1.0% vs May (+$61.6M), +4.3% vs 2Q2011 (+$271M). Dividends paid out at a rate of 22.5c/share totalled $15.3M +12.5% vs last year ($13.6M or 20c/share). In the 1st half of 2012 food retailing accounted for 89.4% of total net earnings compared to 60.4% in 1hlf 2011. The difference is due to gains from the sale of Wajax in 2011 which contributed an additional $76.2m in the 2nd quarter of 2011. Full results for Sobeys at 2Q2012 pdf report. *note: graph to the right will be updated everytime Loblaws releases its data. Empire-Sobeys long term debt: $1.0984 billion as of Nov 5, 2011 (down from $1.168b Oct 2010) $997.8m of which comes from the grocery business (up from $974.2m). Although common shares have been higher year in, year out, preferred series 2 shares have not ($1.13 in fiscal 2008, $0.78 in 2009, $0.44 in 2010, $0.52 in 2011). Loblaws 2q2014 (ended June 14, 2014) 12 weeks : Loblaws begins including Shoppers Drug Mart in results - retail : organic sales up $116 million or 1.6% to $7,488m - including Shoppers Drug Mart, quarterly sales up $2,725m or +37.0% to $10,097m. 24 week sales not including Shoppers, up +1.2% to $14,583m. quarterly same store sales up +1.8% (excl gas bars +1.7%) positively impacted by Easter (+0.1%). sales growth by sector : food moderate, drugstore down, gas moderate, wholesale apparel down significantly though retail moderate, general merch down. last 12 months: new store openings +22, closures 12, net increase of 0.4m ft2 (+0.8%). shoppers drug mart : 2q14 two new stores and five closures. Gross Profit: Loblaws $1,840m +12.1% or adj $2,652m +61.5% : Shoppers added an additional $999m (adj). incr attributed to $190m charge related to inventory measurements (incl $622m worth of SDM inventory sold). Ebitda $(117)m -124.3% or $467m adj (-4.3%) + $281m from SDM. (consol adj +55.3%). total net earnings: $(456m) (vs $177m profit) or $1.13 loss per share (vs $0.63 gain) adjusted for acquisitions: $301m (vs $181m) or $0.75 per share (vs $0.64). Financial Services : revenue 2q: $192m (+29.7%), operating income $38m (+35.7%), ebit $26m (+44.4%). 1q + 2q: $372m (+18.8%), $74m (+27.6%), $49m (+32.4%) respectively. credit card receivables $2,561m +12.4%, annualized yield 13.8% (vs 13.5%), loss rate is 4.7% (vs 4.3%). Loblaws 1q2014 (ended March 22, 2014) 12 weeks : retail : sales up 0.8% to $7.095b (same store sales up 0.9% vs 2.8% 1q13) but operating income down -22.2% to $217m (1q13 included artificial gain related to defined benefit plan amendments / 1q14 brought down by acquisition related costs) when adjusted for these oper inc down only 0.9% to $226m. Gross profit & Gross profit percentage stable at $1580m & 22.3% respectively. same store sales negatively impacted by the timing of Easter. Adjusted operating margin exactly the same at 3.2%. Adjusted EBITDA up 2.0% -> $416m (margin 5.8% -> 5.9%). retail sales up $58m thanks to.. i) growth in food and gas bar sales.. ii) declines in drugstore, flat in general merchandise, apparel. over the last 12 months, 23 stores opened / 12 stores closed = net increase of 0.4 million square feet. financial services segment : revenue $165-> $180 million (+9.1% thanks to higher interest yield / higher credit card receivable balances: average receivable up 10.2% to $2469m). operating income, ebit both up 20.0% ($36m), 21.1% ($23m) respectively. Choice Properties : net loss of $8 million on revenues of $167m ($150m from the retail segment), operating income $118m ($124m adj), net operating income $115m (cash rental revenue less property operating costs). 1Q2014: Loblaws completes takeover of Shoppers Drug Mart : $12.3 billion transaction included $6.6 billion cash (incl $3.5 billion unsecured term loan facility maturing March 28, 2019) and 119.5 million Loblaw company shares. Loblaw consolidated info: Assets $20.616 billion (up from $17.460), cash equivalents $2.537b (vs $689m). total quarterly revenue growth $1.2% (vs 3.8%) oper inc $253m [($268m adj) vs $309m $258m adj)], operating margin stable at 3.7%, ebitda margin up 6.1-> 6.3%, net earnings down 39.8% $171m-> $103m; but earnings up when adjusted for one times items: $134-> $139 million. eps per share: 0.61-> 0.37 or adjusted 0.48-> 0.49. Loblaws 4q2013 (ended December 28, 2013) 52 week year: loblaw revenue growth 2.4% (up from 1.1% in 2012); total revenue $32,371 (vs $31,604). income tax expense increased 8.6% ($210-> $228m) but operating income was up 11.0% ($1195-> $1326m). operating margin unchanged at 1.1%, ebitda margin adj 6.6% (vs 6.5%), retail segment: for the year same store sales 1.1% (vs -0.2%), gross profit margin 22.0% (unchanged), return on avg net assets 10.7% (vs 10.0%). adj margins unchanged for operating 3.7% and ebitda 6.3%. 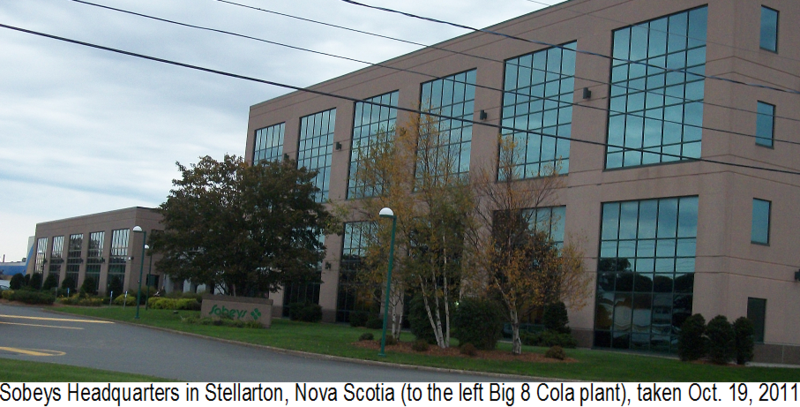 locations and square feet: corporate 570 65,300 ft2 average, franchise 496 29,600 ft2. 26 franchise + corporate stores opened and 13 closed.. net increase 0.8%.. sq footage up 0.4 million. same store sales: moderate in food, gas bar, apparel. flat in drugstore items. in 2013 launched 550 new brand products and improved 640 others. control brand sales at $9.6 billion same as year before. cash equivalents up $1079m-> $2260m (treasury bills $322-> $1420m). In the fourth quarter Choice Properties began contributing new revenue to Loblaw ($319m) net cash rental revenue was $222 million. new admin costs amounted to $12m. for the quarter same store sales was a positive 0.6% (vs 0.0% last year). canada cpi index low at 1.9%. retail segment: sales $31,600 million up $640m or +2.1% vs 2012 ($30,960m). gross profit $6966m (+2.2% vs $6819), oper inc $1185m (+7.7%; adj 1172m -2.1%). Loblaws 3q2013 (ended October 5, 2013) 16 we ek quarter: consolidated same-store sales growth at +0.4% (vs -0.2%) : retail same store sales at +0.1% (vs -0.3%). Loblaw Companies profited $154m (-29.0%, per share -28.6% to 55c) on consol revenues of $10,009m (+1.9%, was +1.03% last year). Adjusted eps better at 78c (-3.7%) still misses analyst estimate of 81c (stock down 8% on the day). strong sales growth in gas bar and apparel; modest in food, declines in pharmacy, general merchandise. Gross profit margin for retail business down from 2q2013 (21.5% vs 22.3%), loblaw cos puts the blame squarely on increased competition from Walmart and new comer Target. Despite retail sales up +1.5% ($9627->$9772m) gross profit remained at $2,104m meaning cost of goods rose faster than revenue. operating income declined by -$31m ($29m adj) due to lower fx gains, higher depr/ammort offset by labor efficiencies. Adjusted operating margin 3.7% (vs 4.0%), ebitda 6.2% (vs 6.5%). Internal food price inflation flat .. national CPI significantly lower at 0.9% (vs 1.8%). Metro Inc released its 4q2013 results the same day (same store sales down -1.8%, adj earnings stable at $113.0m but unajusted down 42.4% to $83.6m due to $21m gain from final disposal of 11% stake in Couche Tard/1 less week this period. Loblaws retail segment: revenue $9772m (+1.5% vs $9627m), gross profit $2104m (same), oper inc $342m (-8.3% vs $373m), ebitda margin 6.2% (vs 6.5%). financial services: revenue $222m (+11.0% vs $200m), oper inc $41m (+28.1% vs $32m), ebit $27m (+42.1% vs 19m). revenue higher due to i) higher credit card receivables (averaged $2297m +11.8% vs $2055m) ii) higher sales from mobile shop. 9 month revenue +14.3% -> $535m. ebit affected by renegotiated vendor contracts (lower costs) and marketing investments (increased costs). quarterly effective tax rate now 26.7% (vs 27.2%), 9-months 26.6% (vs 25.8%). any increase in tax rate during this period is due to decrease in income tax recoveries. 9-months: revenue $24,731m (+2.5%) [retail $24,181m +2.2% / fin.serv $535m +14.3%] adj ebitda $1631 +4.8% [ebit retail $1517m +1.9%/ fin.serv 464m +137%]. Loblaws 2q2013 (ended June 16, 2013) 12 week quarter: same-store sales growth at 1.1% (vs 0.2%). Loblaw Companies profited $178m (+14.1%, per share +14.5% to 63c) on consol revenues of $7520m (+2.0%, was +1.3% last year). according to Loblaws, sales growth strong in gas bar and apparel; modest in food; flat in pharmacy, negative in general merchandise. Gross profit margin unchanged at 22.3% buoyed by lower transportation costs and less theft. Foreign exchange rate positively impacted margins; depreciation and amortization negatively affected operating margins (4.3% up from 3.9%). Ebitda margin 6.8% (vs 6.4%). Internal food prices inflation flat which is lower than what was reported by the consumer price index (1.5% down from 2.5% last year). retail segment: sales up +1.9% $7236-> $7372m, gross profit +2.0% $1611-> $1643m, operating income +6.9% to $294m. oper. margin 4.0% (from 3.8%). financial services: revenue +6.5% -> $148m, oper.inc nearly doubled ($15-> $28m), ebitda up a whopping 350% ($4 -> $18m). credit card receivables +10.7% -> $2279m with the average yield at 13.5% (up from 12.7%). 2013 half: same-store sales 1.9% vs -0.3% last year. total revenue 14,312 -> $14,722m (+2.9%), oper.inc. 529 -> $631m (+19.3%), earnings 278 -> $349m (+25.5%). retail segment: sales +2.6% $14,044-> $14,409m, gross profit +2.5% $3140-> 3219m, operating income +14.6% to $500m. gross profit margin fell slightly (22.4% -> 22.3%) but operating margin was up a healthy 4 basis points (3.6% -> 4.0%). financial services: revenue +16.8% -> $313m, oper.inc doubled to $58m, ebit $8m -> $37m. In the last 12 months (June - June 2013) -- Loblaw opened 23 stores, closed 13 stores -- retail space net change +0.4m sq ft. A $7 billion reit handling 415 properties was launched on July 5 and given the name 'Choice Properties'. The ipo was worth $660 million which included $460 million from individual investors and $200m from George Weston Limited (owns 46% of Loblaw Cos, Galen Weston Sr owns 60% of George Weston). Higher effective tax rate this year ! 26%-27% full year 2013 up from 24.9%. capex $1b same as 2012. Loblaws 1q2013 (ended March 24, 2013) For the 12 weeks ended March 24, Loblaw Companies profited $171m on revenues of $7.202 billion (+3.8%) 86.4% or $229m of the $265m revenue growth came from retail sales ($7.037b +3.4%), impressive considering the national food consumer price index was up only 1.4% this quarter. A collapse of a factory in Bangladesh which housed Joe Fresh Style textile workers hit the company's brand reputation but the company remains optimistic about the situation: Loblaws has compensated families affected by the tragedy and is working to improve working conditions there. The financial services segment showed a 375% increase in earnings before taxes. Operating income improved markedly due to 1) renegotiated pc telecom vendor contracts 2) higher mobiles sales and more banking services revenue (credit card transactions increased both in number and value). Loblaws anticipates that the initial public offering of its real estate investment company will take place in July 2013, the market value of assets affected by the ipo exceeds $7 billion. same-store sales +2.8%. Loblaws Fiscal 2012 (ended December 29, 2012) For the 2012 fiscal period, revenue at Canada's leading grocer is up +1.13% to $31.604 billion, with net sales of retail items up a marginal +0.8% ($30.703b -> $30.960b). The company failed to translate the additional revenue into profit: Gross profit (-$1m), operating income (-16.1% to $1101m), operating margin (4.3% -> 3.6%) all declined. Though the financial services segment (boosted by the launch of new mobile shop kiosks / higher credit card transaction values) exceeded expectations (revenue +17.7%, operating income +31.1%, ebit +108.3%) Loblaw Companies still didn't improve its bottom line (total net earnings down -15.5% to $650m .. the lowest level in more than two years). EPS (basic) down to $2.31 (-15.4% vs 2011, -4.9% vs 2010). Bright Spots - cash equivalents +3.07% -> $2.047 billion : not bad considering expenses the company faced in new product launches, store renovations, ecommerce, expansion of apparel department). The bad - Fourth quarter profit was down -17.82%; that despite both quarters being 12 weeks long. In the other three quarters (q3 q2 q1) profit was down -5.9%, -19.3%, -22.2%, respectively. Same-store sales growth: -0.2% (vs +0.9% the year before) which is disappointing considering Sobeys (+1.4%) and Metro (+1.2%) showed strong growth (investors should be asking this: why is competition affecting Loblaws more than Sobeys, Metro, Costco ? ).X this year's amount. Also of note: This is the second year with Vicente Trius at the helm (hired Feb 24, 2011). Loblaws 2Q2012 (ended June 18, 2012) profited only C$159m in the second quarter of 2012, -19.3% lower vs 2q11, that despite quarterly revenue being +1.33% higher ($7.375b which is actually the highest quarterly revenue in the last 4 quarters). 18.6% of the increase in revenue ($18m/$79m) actually came from the financial services segment (nice considering financial services only accounts for 1.8% of total revenue). the half) were also down significantly. According to Loblaw Companies in its quarterly report, there are a couple reasons for the relatively poor results: 1. Higher labour costs 2. marginally higher food sales (though Loblaws did attribute part of that to food price inflation which according to the CPI index was 2.5% last quarter (down from 4.0% in 1Q2011) 3. $10m in customer appreciation costs / loyalty programs 4. flat sales of apparel, joe fresh style, drugstore items. Dividends per share steady at 21 cents (41c for the half) even though Earnings Per Share were down -18.6% (70c --> 57c / 128c --> 101c for the half). June 2012: Loblaw Companies store number is now at 1046 (585 corporate / 462 franchise) up from 1032 (578 corporate / 454 franchise) June 2011. Over the last 52 weeks loblaw companies added 0.4m ft2 to sales space --> 50.2m. same store sales growth +0.2%. 1Q2012: Loblaws profited $126 million in the quarter ended March 24, 2012 (1q12), a decrease of 22.2% over the previous year despite sales increasing by +0.9% to $6.937b; Keep in mind however that 1q12 revenue is down -5.9% from the previous quarter and is actually at its lowest level since 1q11 (when revenue was $6.872b); Also consider that 0.8% of the revenue is attributable to one less day of store operations. 98.1% of revenue orginated in retail where same-store sales fell -0.7%, gross profit fell -1.6% to $1.529b and operating income was 21.1% lower at $225m. Results were particularly disappointing when operating margin (3.3% down from 4.2%) and gross profit margin (22.5% vs 23.0%) are considered. Good News regarding 1q12: Loblaws opened 25 new stores but closed only 5 resulting in a net addition of 0.6 million square feet of sales space = +1.2%. Sales in clothing and other apparel was strong as was growth in revenue from gas stations (higher pump prices); Those factors compensated for flat sales in both food and drug products. There's been lots of negative pressure on Loblaws revenue stemming from flat food sales and lower sales in drugstore, apparel and general merchandise. Not all sources quote the same market share. According to the USDA/Statistics Canada, as of 2011 (report released March 9, 2012) Canada's food market is $88.0 billion in size (19.0% of Canada's total retail market size of $451b +6.0% vs 2008) and only 43% of that is represented by one of the 3 largest grocers (Loblaws 31%, Empire-Sobeys 18%, Metro Inc 13%); All supermarkets combined represent 63.5% down from 67%. --> new website launched at grocerynews.org --> indepth coverage of the grocery industry. Loblaws Quarter ended Dec 2011 Though annual revenue (+2.7% to $31.25 b), ebitda (+5.5% to $2.083 b), profit (+13.9% to $769m), eps (+12.3% to $2.73) and same-store sales (+0.9%) were up across the board a closer look reveals problems. The 62c eps in the latest quarter missed analysts expectations of 66c, gross profit margin fell to 22.2% from 22.4% and the 3.6% sales increase in the 4q is attributable to an extra shopping day. But it did beat revenue projections of $7.24b ($7.37b). Also disconcerting is the fact that gross profit from the food retailing business (98.2% of Loblaw Cos sales) barely saw any gain on the year (0.49%) despite revenue rising to a record high (total company revenue surpassed $31b for the first time ever). An abberation? Financial services revenue growth of 24.7% in the 4q was due entirely to increased credit card use (Canadian household debt is among the highest in the world and there already are signs from Dec 2011 that Canadians are cutting back). Add to that the fact that basic earnings per share were up 5.1% in the 4q compared to 18.3% qoq increase in the 3q (eps averaged over each week comes in at 5.17c in the 4q vs 5.25c in the 3q). Maybe that's why investors responded to Loblaw's highest year-to-year revenue increase since a 4.8% rise back in 2008 by pushing the stock down 5.7% the day of the release. Overhaul of the IT & supply chain will cost it about $70m more in 2012 as it attempts to become more customer oriented. Some of the positives to consider: same store sales grew in 2011 (+0.9%) something that didn't happen in 2010 (-0.6%) or 2009 (-1.1%). In 3Q 2011 Loblaws profited $236M in the quarter ended October 2011, an increase of 19.8% over the previous year despite sales increasing by only 2.0% to $9.7B; that was only the second quarter to quarter increase in revenue since a 3.5% decrease back in March. Loblaws remains optimistic that it will weather new competition from Target when it begins shop in Canada in 2013 (same year Loblaws will move into e-commerce beginning with Joe Fresh Style). Target paid Hudson's Bay $1.8b for Zellers leases. Empire Theatres As of February 3, 2013 there are 52 locations with 434 screens which is down versus the previous quarter. November 3, 2012 Empire-Sobeys owned 53 separate cinamas across Canada (up from 51) consisting of 438 screens (up from 386 a year earlier). It the second largest movie exhibitor in the country ! Between May 2010 and May 2011 no net additional theater locations were reported by the company, but that changed in 2012 when 2 were added. In the fourth quarter of fiscal 2011 sobeys attributed the drop of 13.8% in sales from other operations to lower box office attendance due to movies having less consumer appeal. Discount Food (Nov/Dec 2011): Metro Inc: Food Basics, Super C (194 stores combined) Sobeys: FreshCo (64) and Foodland (196) and Cash and Carry (9) Loblaws: No Frills (175), Value Mart, Wholesale Club, SuperValue, SaveEasy. Sobeys parent Empire Company Limited has actually been controlled by the Sobeys clan since 1947 when Frank Sobey bought it for its land and ability to be transformed into an investment company (1947 was also the year Sobeys opened its first supermarket store in Pictou). It was on the eve of Sobeys' 100th anniversary (celebrating JW's birthday, originally a marketer of meats) that Sobeys purchased Empire Company outright, acquiring the 27.9% of shares it didn't already own, for $1.06B or $58/share (April 26, 2007). That represents a $2-4 premium over the fair market value (Sobeys shares were delisted from the TSX on May 2, 2008). Quebec Sobeys has a significant presence in Quebec but not in the traditional sense; More than half of the locations are smaller supermarkets Marche Benichoix, Les Marche Tradition (118 combined). The only full service brand that it operates there that competes with Metro's 370 stores is IGA. Half of the over 200 IGA stores are IGA Extra located in suburban areas. Sobeys has experienced tremendous growth over the last decade even before its recent successes, between 2001 and 2006 Sobeys stock price rose by over 68%. Sobeys also has a significant stake in Canadian real estate Crombie REIT: interest was 42.7% in August 2013, 42.8% in May 2013, 42.9% in Feb 2013, 43.0% in Nov 2012, 44.6% in Feb 2012, 45.9% late 2011, 46.5% Jan 2011. Owns 40.7% of Genstar Development Partnership. With Canadian real estate prices climbing (average home price up 6.5% in September/# of properties sold up 2.7% qoq) those investments are bound to pay off. Crombie Reit's properties include both high end assets (Barrington Place Shops, Cogswell Tower, CIBC Skyscraper in Halifax) and more traditional retail assets (Greenfield Park IGA plaza, Quebec). Sobeys also holds 100% ownership of Canada's second largest chain of movie theaters, Empire Theatres (Sobeys has operated cinemas since 1984). 2011 is also the year Sobeys converted most of its mainline locations into 24 hour supermarkets taking away from Superstore a key competitive advantage. About 85% of Empire's assets are associated with the food retailing business). Sobeys first reached $1 billion in sales in 1987, in 1999 (2000 fiscal year) Empire-Sobeys sales surpassed $10 billion for the first time, reflecting the first full year the Oshawa Group was part of it. Although revenue increased 75% that year, net income fell 35.7% to $86.7m. Food retailing makes up 98% of sales and 90% of operating income (2011 & 2010). The commercial real estate business contributes about 30% of funds from real estate operations even though it only contributes less than 15% of real estate revenue. Food Retailing: net debt/net total capital ratio was at its lowest level in 2011, hitting 13.4% it was as high as 32% just three years ago (2008). There are about 289 standalone Sobeys locations across Canada (23% of the company's locations). In fiscal 2011 57 freschco stores were opened, which exceeds units opened by main competitor No Frills. -> In 1999 it acquired the Oshawa Group, owner of IGA Canada ($1.5b increased sales by about 75% or $4b). In March 2002 Sobeys sold Serca Foodservice formerly part of Oshawa Foods to SYSCO for $411M. Since March 2006 Sobeys sold 105 properties to Crombie REIT raising 897M in 2 transactions. In 2011 Sobeys divested itself of Wajax stock by selling 27.5% of Wajax Income Fund for $121.3M (used the proceeds to pay down debt). The market value of all of its real estate investment holdings was 451.2M on May 7, 2011 comapred to $487.7M a year earlier (decrease was due completely to the divestment of its Wajax investment which was worth 117.9M in 2010). -> Sobeys went private in 2007 when it became a subsidiary of Empire Company Limited following Empire's purchase of $1.06B worth of Sobeys outstanding common shares bringing its interest up to 100%. The company's 2011 revenue is 61% higher than it was in 2002 (145% increase in book value per share: 47.76). -> In 2010 Sobeys lowered its debt to capital ratio from 32.7% down to 29.3% and consequently (in May) both Standard & Poor's and DBRS raised Sobeys credit rating. During fiscal 2010 food retailing/real estate represented 94% of net income. At the end of 2010 total locations (food retailing) under the various banners were 1,334 (28.1m square feet) in 836 communities. In 2011 free cash flow fell to $132.6M from 350.1M. In 2011 the company expanded 12 stores (down from 13 in 2010/11 in 2009), opened 44 (up from 41 in 2010/47 in 2009) and closed 39 locations (down from 52 in 2010). Since 2001, fiscal year dividends have more than quadrupled from 20c to over 80c a share. Sobeys avg # of shares traded was highest in 2010 68.4m vs 67.9m fiscal 2013; 68.2m 2011, 65.8m 2009.
corporate locations December 2015: Loblaw Cos 604 (2014: 615; 2013: 570, 2012: 579), Sobeys 971 (2014: 971, 2013: 746, 2012: 736, 2011: 629). franchised locations Dec 2015: Loblaw Cos 529 (2014: 527; 2013: 496, 2013: 469), Sobeys 895 (2014: 849, 2013: 822, 2012: 839, 2011: 708). Metro Inc total locations February 2016 : 621 large grocery (343 Metro, 89 Super C, 124 Food Basics, 65 Richelieu) 288 small grocery (151 marche ami, 137 marche extra), 427 convenience stores. Metro Inc total locations September 2013 : supermarkets 635 (-6 : Metro 358 [-12], Super C 85, Food Basics 116, Richelieu 76); grocery 277 (ami 81, extra 196); convenience 415. Market Share: using most recent food retailing data available for Canada as a guide and Loblaw claims that 14m or 40% of Canadians shop there each week, we can estimate Loblaws share at 32% ($28-29b in food sales out of $87b in Canada), as of 2013 Sobeys is at 19% (58% as much food revenue as Loblaws ~$15b vs ~$28b), and Metro is at 15% ($12b). Shoppers Drug Mart 1h2013 results: same store +2.2%, pharmacy +3.2% $2.415b, else +3.9% $2.609b, prescr +7.1%. 2012 full year same-store sales growth 2.2% versus -0.2% for Loblaw Cos.
2014-2018 Sobeys divestments. July 8: sells four Safeway milk and dairy products making facilities to Agropur Cooperative for $344.2 million; December 2 sells two bread manufacturing facilities to Canada Bread Company for $27.8m. 3 months ended November 2011: grocery prices declined 1% at Sobeys despite raw material costs going up, a consequence of intensified competition. Loblaws goal for its apparel unit, Joe Fresh Style is $1 billion in annual sales. Loblaws is expected to spend $110m in 2012 just on improving information technology and product promotions. In 2012 a partnership was formed with JC Penny - Loblaws clothing line Joe Fresh now sold at 700 JC Penny locations throughout the United States. July 8, 2014 - Sobeys sells 4 Safeway Dairy processing facilities to Agropur Cooperative for $344.2 million money used to pay down bank borrowings. As of Feb 3, 2013 Empire Theaters operates 52 theaters consisting of 434 screens which is down from 53 and 438 Nov 2012. Sobeys was in the cinema business from 1984 until 2013. Divestments June 27, 2013 - Theatres sold for $255m - $200m from Cineplex, $55m from Landmark. money is used to finance Safeway takeover. A total of 26 theaters/218 screens were transferred to Cineplex (24/170 in Atlantic Canada), another 20/179 screens went to Landmark Cinemas (Western Canada). In total, 47 theatres/397 screens were transferred from Sobeys to Cineplex, Landmark. Empire other investments August 2013 Crombie $527.1m (42.7%), Genstar 197.5m (40.0% May), cdcp $9.6m (+2m), US/Can real estate partnerships $209.8m (+51.5%) May-May 2013 Crombie +$122m +23.4%, investment in associates +$94.2m +30.0%. In 1q2014 Crombie interest gave Sobeys $6.7m oper. inc. +20% vs 1q2013. On September 23, 2011 Target Canada announced that it had reached an agreement with Sobeys in which Sobeys will become the primary supplier of grocery items. The deal is big for Sobeys because for the first time it will be able to sell its own private label items outside of franchised/corporate locations Sobeys, FreschCo, IGA, etc. A similar agreement made in the US between Target and SuperValu Inc significantly boosted SuperValu's revenue and market access (operates over 2,500 locations but that number nearly doubles when Target and other stores it serves as primary distributor are included). 125-135 Target locations are slated to open begining in 2013. Since the news broke about a month ago Sobey's stock is up 6.2%. On November 15, 2011 announced that it had reached a deal with the National Bank of Canada involving the sale of 15,000 tonnes worth of CO2 greenhouse gas emission gas credits (annually) to the bank, allowing the bank to be a neutral emitter. At present Sobeys has an excess of credits in Quebec due to improvements at IGA locations where it sucessfully replaced harmful refrigeration gasses. December 15, 2011: Sobeys announces the purchase of 250 Shell gas stations in Atlantic Canada (50) & Quebec (200); However, when the deal closed on March 15th the number of stations was lowered to 236 47 of which are in Atlantic Canada (the rest in Quebec). The acquisition cost Sobeys $215 million. Positive effects of the Shell deal: 1) Greatly expands cash flow for Empire's non food business segment. 2) The gas stations will give Sobey's convenience store business more leverage. 3) Gas stations enjoy high gross profit margins, something that Sobeys hasn't been able to improve (stuck at around 24%, a low ebitda margin of 2.7% was cited as being main reason it sold Serca food distribution business back in 2001 for $440M). Shell is supplied with refined oil by Imperial Oil which is controlled by the world's biggest oil company Exxon Mobil (65% ownership). The acquisition increases Empire-Sobey's annual fuel volumes by 1 billion litres. In the discount supermarket sector Sobeys' FreschCo competes directly with Loblaw's No Frills in Ontario (though FreshCo hasn't yet been introduced to key areas such as Halifax), in Quebec discount there's also Metro's Food Basics and Super C. Superstore (Real Canadian or Atlantic depending on the region, the superstore brand represents 1/5th of Loblaw's corporate run locations), Provigo (taken over in 1998, presently Provigo is the largest Loblaw brand by locations, twice as many as Superstore), Maxi, Great Food and Zehr's take on Sobeys, IGA and Foodland head to head in regular priced food retailing in central and eastern Canada. In Ontario and Quebec there's also Metro's Food Basics and Super C.
Sales at Sobeys first reached $1 billion in 1987. In 1999 (2000 fiscal year) Empire-Sobeys sales surpassed $10 billion for the first time, reflecting the first full year the Oshawa Group was part of it. that compares to less than 20% (257/1271) for Sobeys (Thrifty Foods, Freshco) and 34% for Metro (end of 2011: 79 Super C, 115 Food Basics, Metro total 564). On June 29, 2012 Marc Poulin will replace Bill McEwan (health/retirement) as CEO of Sobeys. Bill was instramental in getting Sobeys the deals it has with Target and Shell. He is an inspiration to anyone wanting to move their way up in any company; Bill started out bagging groceries and ended up president !